We here at Logan River Academy have decided that we are going to start holding a monthly party for all students who are passing their class with less than two missing assignments and/or are completely caught up in their online classes. This party is being planned by our own Ms. Logan and is wholeheartedly supported by the academic staff. Another group of Logan River Academy students reached the milestone of meeting graduation requirements and had the opportunity to participate in a commencement ceremony. 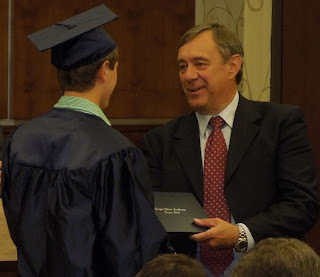 As we gathered to celebrate the progress of these young dedicated students, each one joyfully walked up to accept his or her high school diploma as parents and friends from around the nation gathered to look on and congratulate them on their success. As always, we are very proud of all of our graduates and hope for the very best for each of their futures. Logan River students enjoyed another tour of Utah State University and Bridgerland Applied Technology College this last semester. What stood out for students on the USU tour was the great atmosphere. They observed the diverse student body that embraced a positive and diverse culture. It was overwhelming and impressive for them to learn how much goes on at one single campus and to learn that it is an academic powerhouse. Afterall, USU is a Carnegie Level One school—top 3% of schools in the country. At Bridgerland, the students were able to tour a school that provides a fast track towards their future college and career success. They were awestruck at the amount of courses offered that enables a person to get a job within a short period of time. It is always a great opportunity to expose our students to a couple of different options for their post-high school education and give them a chance to think about what they might like pursue for their own future education and careers. Some of our students enjoyed attending an Organ Festival at the Kent Concert Hall on Utah State University's Campus recently. Stephen Cleobury played a selection of Organ Music which was at times accompanied by the Utah State University Chorale and Chamber singers. The students enjoyed the variety of music as some pieces were fast and spirited while others were slow and contemplative. The students also remarked on the intricacy of the organ tubes, the different moving pieces and complexity of the instrument. We have had a fun filled semester and the students are enjoying their exploration of culture and art! Our Adventure Art and Culture class went off campus this semester to view a film screening at the Nora Eccles Harrison Museum of Art that complimented the exhibition exploring craft and art. The film was called Craft in America and showed the working processes and lifestyles of different craft artists in America. The film explored everything from basket weaving and glassblowing to ceramics and jewelry making. The students enjoyed seeing and learning about the different processes and products that each method produced. It also didn't hurt that there was a snack table at the screening. One of the classes we offer at Logan River Academy is an Adventure Art and Culture course which gives students the opportunity to explore a variety of cultural and adventurous activities that help broaden their understanding of different types of art and expression. The students attend local cultural and art exhibits and spend time in nature on hikes and in different plein air (on location painting or drawing) art activities. One of the events the students attended this semester was a one woman show that explored different depictions of influential women in black history. The performance by actress Janice Brooks was engaging and entertaining. The students enjoyed singing some of the historical songs as Janice led the audience in song and appreciated her transformation of costumes and personality between her depictions of the different women. A class of Logan River Academy students recently went to the beautiful Nora Eccles Harrison Museum of Art on the Utah State University campus. The students were met by a guide who showed and explained the intricate art displays. The first artwork was a permanent installation of 100 shoes hanging on wire cords from the ceiling. The guide pushed a button and the shoes started making sounds. Soon, the students realized the shoes were making rhythmic music. They were then shown and told the history of artwork from the Black Mountain College of Design through the exhibition ‘Shaping Craft + Design’. The displays included a double sided tree made out of wires which looked like a painting, vases and urns with intricate designs, knotted-like patterns, interesting designs from orange threads being sewn together, attractive and practical chairs and desks made from different kinds of rich materials, and very colorful 3-D sculptures that seemed to jump out at you. The students also had the opportunity to show their own artist abilities with the watercolor pencils made available for their use. It was a great, enriching experience for the students to be exposed to so many different forms of art and be able to express themselves with their own art as well.